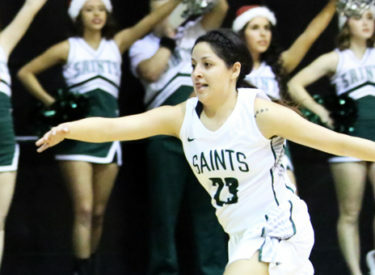 The #8 Seward County Lady Saints cruised to win number 11 on the year Saturday night in the Greenhouse, jumping out to a 15-0 lead to begin the game before putting up a season high 110 points in a rout of visiting Neosho County. For the second straight game, Seward looked to NJCAA National Player of the Week Mollie Mounsey early on and the sharpshooter began Saturday night’s game just as she had Wednesday’s, with a pair of threes in the first minute of action to give the Lady Saints a 6-0 lead. Flying around the court on both ends of the floor, the Lady Saints quickly parlayed that 6-0 lead into a 15-0 advantage, forcing five Neosho turnovers and getting another triple from Mounsey to blow the game open. Seward didn’t stop there, eventually racking up 11 more points to finish the quarter, taking a 29-8 lead on the Panthers after one. In the second quarter, it was time for the Lady Saints bench to get involved. Seward got five quick points from Diamond Bailey and five more from Brennyn Seagler to push their lead to 25 at 35-10. Neosho County was careless with the ball, handling the leather like a greased pig and Seward took advantage, picking up easy bucket after easy bucket to balloon their lead to 46-15 with 3:30 to go in the half. A three from Vanessa Caro before the first half horn gave Seward even more momentum and a 58-22 lead into the locker rooms at the break. Seward shot 49% in the half and 43% from the three point line while holding Neosho to just 6 first half field goals and forcing 21 Panther turnovers. Mounsey led Seward with 15 first half points while Erin Richardson had 11 and Seagler had 9. While the game plan going in, was to limit their three pointers attempted, the way Seward was shooting it on this night, Lady Saints Head Coach Toby Wynn was content with letting them fly from deep. Seward knocked down four more threes early in the second half, building their lead to 70-24 within the first three minutes. The two played even through the last seven minutes of the third, but after three quarters of action, it was all Seward County, leading Neosho County 85-39. Mounsey and Richardson continued to show off their range as the fourth quarter got underway, burying threes number five and six respectively to push their lead to 50 at 91-41. Valerie Caro scored six quick points to put Seward on the brink of the century mark and Bailey picked up a steal and score with 5:15 to go to push Seward over the 100 point mark as they led 101-43. In the end, the Lady Saints would finish off the Panthers 110-54, improving to 11-0 on the season. Seward finished the night shooting 51% from the field in their best offensive performance of the season. The Lady Saints’ 110 points in the win are their most in a game since hanging 110 on Colby February 22nd of last year. Richardson finished with a career best 23 in the victory while draining 7 threes and going 8 for 15 from the field. Mounsey matched her 23 and also picked up 7 rebounds in the victory. Seagler topped her career high for the second straight game with 15 while Ocuane had 14 and Bailey matched her career high with 11 and also had a season best 7 assists for the Lady Saints. The Lady Saints finish the first semester at a perfect 11-0 overall and 9-0 in Jayhawk Conference play. Neosho falls to 4-9 overall and 1-8 in conference action. Seward will have a three week break before taking the court again on December 28th in Pensacola, Florida where they will take on Patrick Henry and #4 Shelton State in a back to back during the Pensacola Christmas Classic in the Sunshine State.